Grrreast for a jungle or zoo party, or any time you want to “stick your neck out” when making cupcakes, consider these fun giraffe cupcakes. How to Make It: Frost cupcake. Use dab of icing to attach puffy cereal to tips of pretzels. (You may want to cut the pretzels to make them shorter.) Let dry for a bit. Use food-safe pen to draw nostrils and mouth on Necco wafer. Arrange 6 licorice strands (or draw 6 lines with writing icing) for stripes and place wafer on top of them. Add M&M eyes. Insert pretzel horns. 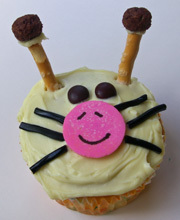 This entry was posted on Friday, May 29th, 2009 at 2:44 pm	and is filed under animal cupcakes. You can follow any responses to this entry through the RSS 2.0 feed. Responses are currently closed, but you can trackback from your own site.